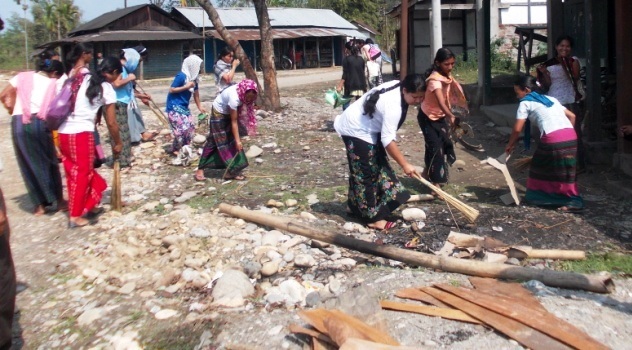 15th July, Seva Kendra Miao: As part of the International Women’s Day Celebration in the Diocese, Sevak Kendra, the Social Service wing of the Diocese organized a cleanliness campaign in and around Namphai – I, Chanlang District. This cleanliness drive, organized with the theme “Be a Clean Society” saw the group of women gathered to celebrate the International Women’s Day in the street with brooms and basket to clean up the surroundings. The Women Group took active part and set a very good example for others to follow. Mrs. Mamoni Ronrang, the President of Self Help Group Federation of Miao Diocese delivered vote of thanks and appreciated everyone for their active participation and co-operation for the campaign.